A few months ago we demonstrated the first Dzongkha-enabled smartphone, the Nokia N900. The list of supported devices has since expanded. If you own an iPhone or iPad (or an iPod Touch), you will be glad to learn that these devices now fully support Dzongkha (Update: some stacking combinations are not available as this is a Tibetan keyboard. Our N900 currently remains the only smartphone with 100% support as well as a DDC keyboard). 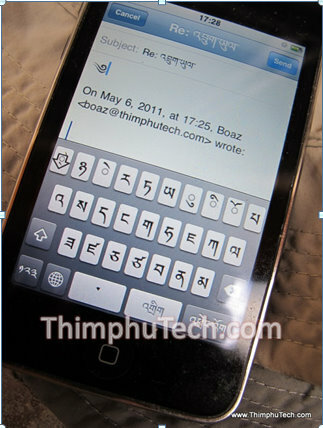 In a recent operating system update (iOS 4.2, November 2010), Apple added a Tibetan keyboard as well as the ability to display Tibetan/Dzongkha letters correctly. Note: Apple's Tibetan keyboard layout is different from the DDC's Dzongkha keyboard layout, as can be seen in the image below. You can find more information here. If you own one of these devices, you are now able to browse Dzongkha websites (such as www.bbs.com.bt/bbs/dzongkha, see below), type emails in Dzongkha, and - if you have an iPhone - send an SMS in Dzongkha. To enable the Tibetan keyboard, go to Settings → General → Keyboard → International Keyboards → Add New Keyboard ... → Tibetan. Hopefully, built-in support for Tibetan/Dzongkha keyboard is in the works also for Google's Android, which is destined to become the most popular operating system for smartphones in upcoming years. thank you very much for this useful information.....works great!